It all started with a phone call... Dennis happily answered all of my questions and provided advice without reservation or expectation of commitment. He then followed up with a quote that was mu ch better than others I had obtained. From the signing of contracts through to the final inspection I always knew what was going on and everything happened within the quoted timeframes. The quality of the work is superb and everyone involved has pride in what they do. Big thanks especially to Dennis, Luke, and Josh! I couldn't be happier and all my friends have shed envy! I collected lots of quotes before selecting B&G Sheds. You had the best quality and one of the best prices. The kit was delivered quickly and it was a breeze to put up. Confirming that the job is done. I want to acknowledge the excellent work done by Russell and Richard. Great guys and great work. I’m happy to recommend B&G and their builders to anyone. The bad news is, I don’t think I will need any more sheds for a while. The builders did a great erection job. Very pleasing to see their attention to detail and finish trimming etc. They said they take great pride in the outcome of what they achieve. Very happy with the shed quality, slab and erection. A Complex Customized job with lots of tough permit issues - thank you! When I first came to you I thought the project might be too tough. Most shed companies turned me away as it was too hard due to the angled walls, cut outs, built over an easement, council consent permits for all sorts of things and a high pitch roof. You said no problems! We found challenges at every turn, but with Dennis's design input and Karen's perseverance, you got through what seemed an insurmountable amount of permits and permissions. With all the permits behind us, I was then so impressed by the quality of the tradespeople. Both the concreters and installers took such pride in their work. The concreters prepared my site and removed the existing concrete, and even preset the wastes drainage in the slab. Peter and Andy were also a pleasure to deal with and so incredibly efficient. The whole job was up in two days. I am so happy with our great new multi-purpose space. All my friends are so impressed. I am happy to recommend B&G Sheds to anyone market for a garage or shed. The 60.0 x 42.0 x 6.0 was much bigger than any of our friends had built ! Even though you had built a large Farm Shed/Verandah & Stables complex and an extension for us before, I was still worried when we built the Indoor Arena. The 60.0 x 42.0 x 6.0 was much bigger than any of our friends had built and they all had troubles with their shed builders. Some went broke, prices changes and others gave them lots of grief. You guys got us through the maze of Town Planning and Building permits and then managed to get the shed complete on time and on budget with no fuss. As usual Tony was amazing and a pleasure to work with! All our customers rave about how great it looks. We look forward to our next project with you. Thank you for your help in the recent erection of my carport. The professional and expert job done by your builders is to be commended. Thanks to Dennis and the team at B&G for our garage which was recently completed. It is an excellent job, with everything done exactly to specification. I would certainly recommend you to anyone else requiring a shed or garage. I am so happy with my new shed. It is good to see there are still ‘old school’ style of contractors out there that take pride in their work. The builder and the concreter both did outstanding jobs. The shed is beautiful , Tony and his crew done a outstanding job. Thank you for all your help. It has been a pleasure working with you. My shed is finished and I’m so very happy with it. All looks good and thanks again for the shed and your professional service and friendly crew. Just wanted to send you all a huge thank you for all your help, understanding and organisation in getting Jason's birthday present shed up and running. Today Peter finished his part in the process and we are more than happy with the outcome! Jason was of course a little surprised to get home yesterday and see its actual size, but that generally happens when the real replaces the imagined. I have always found you easy to deal with and overwhelmingly accommodating to our situation. Everything happened exactly on the dates we needed. We are so happy with our barn! I couldn’t have done it all without you. The difficulty of dealing with all the permits and council requirements was over beyond me, so I was very happy to put them into your capable hands. Our horse float and all our tack now have a beautiful new home. Thank you for your excellent customer service. The builder and concreter all did outstanding jobs as well. I just wanted to thank B&G Sheds for my amazing shed. I love it. All his junk is finally out of the house. I am so happy! Thanks for all your help! It sure looks good up. I’m very happy with the end result. Thanks for all the great work! We are so happy with our new shed. We’ve purchased some great shelving for all Pete’s fishing gear, which fits happily alongside his boat. Great service, price and workmanship. I never thought we’d ever get through all those permits, but finally we did. Thanks for all your help – I could never have done it myself. So rapt with my shed. I’m sure all my neighbours will be jealous now! You should be hearing from one of my friends soon, as he is ready to go. We are very happy with all aspects of our experience with B&G Sheds. I could never have done the permits myself and was more than happy to give them to you to do. The service, slab and workmanship, were all fantastic. You made it such an easy and stress free experience. 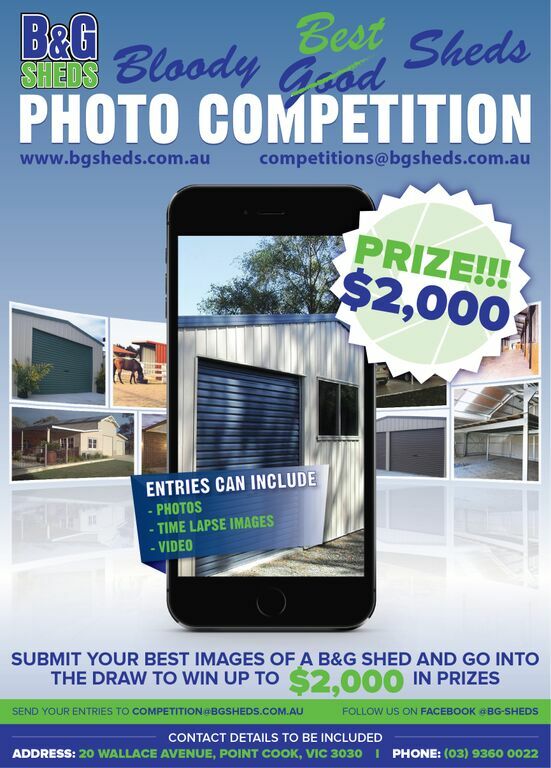 We’ll certainly be recommending B&G Sheds to all our friends and family. Thanks again for my shed.